I've been learning Arnold for the past 2-3 weeks now and wanted to show some of my renders. I'll go over the benefits and weaknesses I find as I go. This is a 3d model, color, and displacement maps from http://www.ir-ltd.net and has been flying around the internet lately. There are some nice VRay (and even an occational Mental Ray) renders of this head online. Thanks ir-ltd.net guys for a nice model to render! Ok, so before I go too far into this, I want to mention that this is only a SSS skin shader. I didn't do anything to the eyebrows. I initially started with some setting recommended by the Arnold tutorial site. I tweaked more and more settings, broke up the color map and made separate maps for deep, mid, and shallow SSS, and spec. The SSS is similar to the mia_SSS shaders as it has multiple SSS mattes and scatter maps. In my experience it's nice for photo realism, but is a bit over the top for stylistic characters. Not really a complaint, but I do like the simplicity of the VRay SSS shader when appropriate. The real beauty of Arnold is the incredibly fast progressive renderer, allowing for almost immediate feedback durring lookdev. I worked on this render for about 2 hours. During that time, I adjusted every switch and slider in the SSS shader and was able to quickly understand what did what and how it differed from other SSS shaders from other renderers. The IPR probably updated 100-200 times during lookdev, and I was able to finish this so quickly. 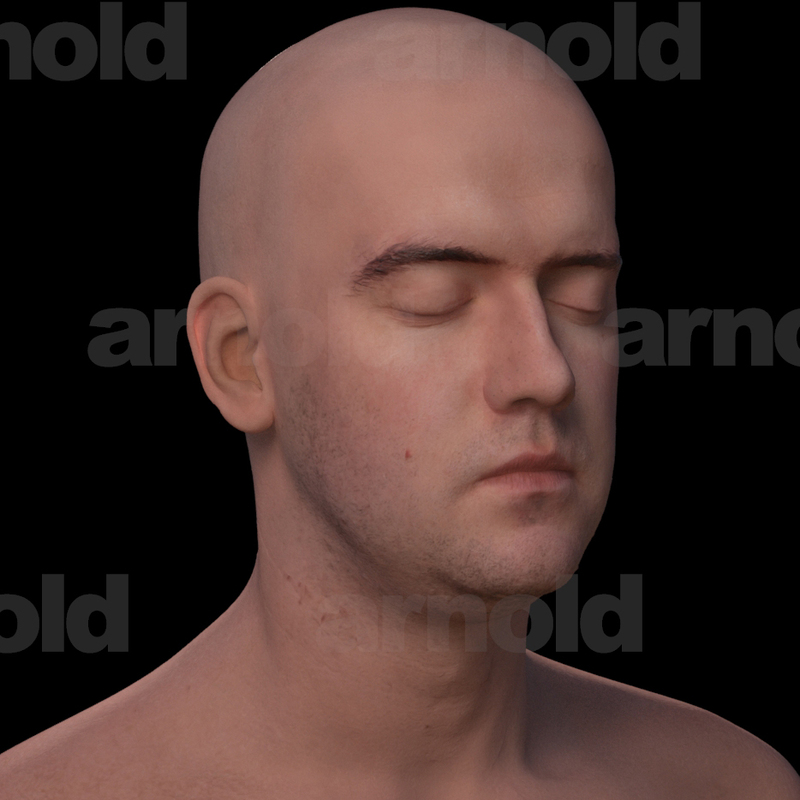 The other beauty of Arnold is for most of my test renders are extremely quick. This render at 1200 x 1200 rendered in 3:26! I don't imagine my flicker free FG pass would finish that quickly. I've had some render slow downs in interior enviornments where everything is primarily GI, (I'll address this in a later post), but overall, I'm really liking Arnold. So after doing another character with SSS in VRay, I have to say I've taken a 180 on the whole 3 color maps in SSS thing. I really feel there is more control and gives you better results faster. +1 for Arnold.